We've been sent some new pictures from S.'s Mom. This first picture is something that many of us have been discussing. Once the child is able to move by himself that is exactly what he will do.....especially at nap time! I'm not sure what the solution is but I'll do some more reading and ask a few questions and discuss what I find in a future post. This next photo is of S. in his high chair. The initial cost of these chairs is quite high but the investment is worth it because the chair grows with the child. 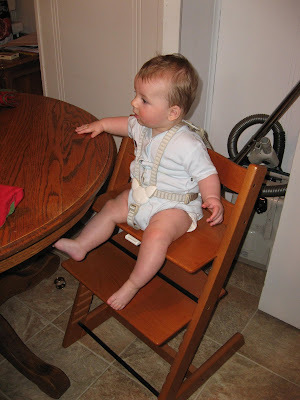 The beauty of this type of high chair is that it allows the child to be pulled right up to the table facilitating more participation in family life. Here's a link to more info. about this type of chair. 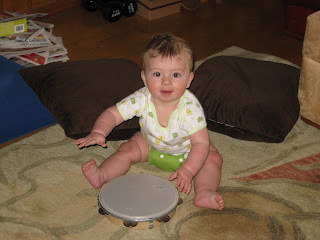 Lastly, here is a picture of M. banging on a tambourine. This sort of activity is essential to the development of a young child. Not only is he refining his fine and gross motor skills while making that lovely sound, he is also developing his sense of rhythm and, if Mom and Dad join in, is discovering how much fun music can be. Note the cushions behind him. If he falls over, he won't hurt himself but, more importantly, they don't hem him in. Watching a child learning how to move (and they do this from birth) and then bunging him into a playpen the minute he can get himself from room to room throws up huge obstacles in his developmental path and can be immensely frustrating to that young child. Now before I sound too holier-than-thou, I tried a play pen with my oldest thinking it would help me in some of the household chores. Wrong! He was so upset that I soon abandoned the thing and did any chores with him in a sling or backpack. When he was older, he was usually right beside me helping. Labels: montessori bed, music, S.
My son is 4-months old. I am putting him on his floor bed even now but putting pillows around the bed! He uses it only during day since he loves looking at the mirror beside the bed, but does not sleep on it yet. I am gonna put him on it to sleep after he starts crawling. I have to say that "floor bed" is one of the best ideas ever! Even a small baby is very happy and confident with that! 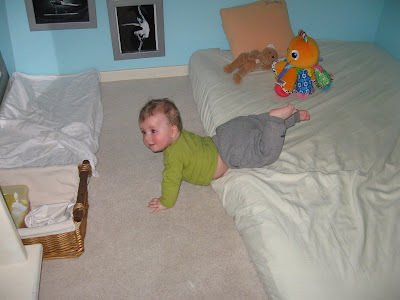 I'm not a parent, but from what I've read regarding sleeping patterns, Montessori suggested allowing the child to follow his own sleep patterns by setting up a small pad/mat wherever the parent and child happened to be. That way, if the child was tired he could retire to the mat and nap while the parent continued with her daily routine. 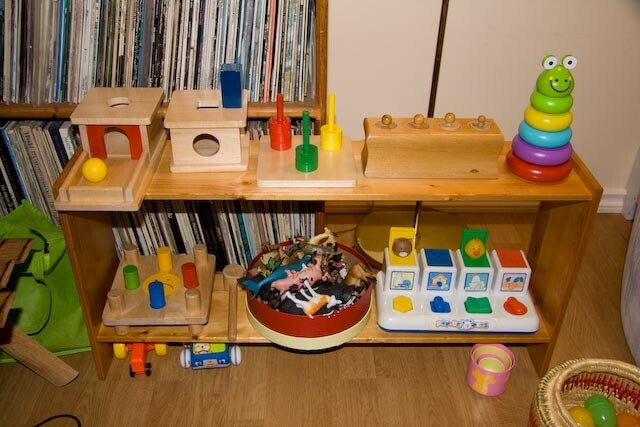 To me, a specified nap time seems forced and unnatural, and of course the child will sometimes not want to stay in his bed, especially when there are so many interesting things in the room to explore. But then again, I don't have children and I understand the pressures of modern life. Awesome comments from everyone! Thank you so much for these useful ideas and observcations. We use a floor bed and seem to have found an equilibrium with our ten month old and naptimes... when he is sleepy, or when he has been up for several hours and I think he *should* be sleepy, I put him in his room and shut the door. Generally if I come back in fifteen minutes he is asleep on his bed (and there will often be evidence he got toys out before settling down to sleep). I don't know if every child will do this - I have a nephew whose parents have had awful trouble getting him to nap during the day, and although they were using a cot and prescribed nap time I'm not sure he would have responded as well as my son does to my method of just leaving him in his room.